Please join us on Wednesday, March 6, 2019 at 1pm Eastern, for a National Call to discuss last week’s announcement regarding the Hospital 5-Star Rating system. Encore is an audio recording of this call that can be accessed by dialing 1-855-859-2056 beginning 4 hours after the call has ended. The recording expires after 2 business days.This National Call is not intended for the press, and the remarks are not considered on the record. If you are a member of the Press, you may listen in but please refrain from asking questions during the Q & A portion of the call. If you have inquiries, please contact CMS at Press@cms.hhs.gov. Thank you. ‍A transcript and audio recording of this National Call will be posted to the Podcast and Transcripts website at https://www.cms.gov/Outreach-and-Education/Outreach/OpenDoorForums/PodcastAndTranscripts.html for downloading. Do you have ideas about how to make residential placement better for youth? Interested in speaking? Need an interpreter? You’re encouraged to sign up by February 22nd by emailing Victoria.Hepp@phila.gov or registering on Eventbrite. The new “What’s Covered” app lets people with Original Medicare, caregivers and others quickly see whether Medicare covers a specific medical item or service. Consumers can now use their mobile device to more easily get accurate,consistent Original Medicare coverage information in the doctor’s office, the hospital, or anywhere else they use their mobile device. In addition to the “What’s Covered” app, through Blue Button 2.0 the agency is enabling beneficiaries to connect their claims data to applications and tools developed by innovative private-sector companies to help them understand, use, and share their health data. Download the complete press release for more details. Einstein Behavioral Healthcare Network and the Freda Kraftsow Sacks Family Resource Center present Suicide: The Ripple Effect. The following information is provided by Einstein Behavioral Healthcare Network and the Freda Kraftsow Sacks Family Resource Center. The film screening of Suicide: The Ripple Effect will be held on Tuesday, November 27, 2018. The event is open to the public, free admission, free depression screenings and more. Download this event's flyer for more details. As developed by the Family Committee of the Pennsylvania Psychiatric Leadership Council (PPLC), the Pennsylvania Office of Mental Health and Substance Abuse Services has posted the competencies for psychiatrists working with families. With increasing recognition and acceptance of the benefits of family inclusion in the recovery of individuals who have mental health and co-occurring disorders, OMHSAS supports the document created by the PA Psychiatric Leadership Council “Family Inclusion Competencies for Practicing Psychiatrists”. OMHSAS has determined that family inclusion is consistent with the recovery principals and will have positive effects as family and significant person’s inclusion in treatment and services are implemented in the community. View the competencies for psychiatrists working with families. Einstein Adult Crisis Response Center (CRC) is moving to a new location effective Wednesday, October 17, 2018 at 8 am. ‍Note: Individuals arriving for CRC intervention must enter through the emergency room for triage. The emergency room is located at the back of the main hospital tower facing Old York Road. ‍Medicare Part B covers physician services, outpatient hospital services, certain home health services, durable medical equipment, and certain other medical and health services not covered by Medicare Part A. The standard monthly premium for Medicare Part B enrollees will be $135.50 for 2019, a slight increase from $134 in 2018. An estimated 2 million Medicare beneficiaries (about 3.5 percent) will pay less than the full Part B standard monthly premium amount in 2019 due to the statutory hold harmless provision, which limits certain beneficiaries’ increase in their Part B premium to be no greater than the increase in their Social Security benefits.CMS also announced that the annual deductible for Medicare Part B beneficiaries is $185 in 2019, an increase from $183 in 2018. ‍Medicare Part A covers inpatient hospital, skilled nursing facility, and some home health care services. About 99 percent of Medicare beneficiaries do not have a Part A premium since they have at least 40 quarters of Medicare-covered employment.The Medicare Part A inpatient deductible that beneficiaries will pay when admitted to the hospital is $1,364 in 2019, an increase of $24 from $1,340 in 2018. ‍Medicare beneficiaries can choose to enroll in fee-for-service Medicare (Parts A and B) or can select a private Medicare Advantage plan to receive their Medicare benefits. Premiums and deductibles for Medicare Advantage and Medicare Prescription Drug plans are already finalized and are unaffected by this announcement. Last month, CMS released the benefit, premium, and cost sharing information for Medicare Advantage plans in 2019. On average, Medicare Advantage premiums will decline while plan choices and new benefits increase. On average, Medicare Advantage premiums in 2019 are estimated to decrease by six percent to $28, from an average of $29.81 in 2018.For a fact sheet on the 2019 Medicare Parts A & B premiums and deductibles, please visit: https://www.cms.gov/newsroom/fact-sheets/2019-medicare-parts-b-premiums-and-deductibles. For more information on the 2019 Medicare Parts A and B premiums and deductibles (CMS-8068-N, CMS-8069-N, CMS-8070-N), please visit https://www.federalregister.gov/public-inspection. The U.S. Centers for Medicare and Medicaid Services (CMS) has issued a one-year extension of its current policy, which offers penalty relief and enrollment assistance to individuals who delayed Medicare enrollment while receiving coverage through the federal health insurance marketplace that was established under the Affordable Care Act. This policy, known as time-limited equitable relief, helps some Medicare beneficiaries correct problems with their Part B enrollment that result from confusion or misinformation regarding Medicare and the marketplace. Under this relief, Medicare-eligible individuals with marketplace coverage can apply to enroll in Part B without penalty, and those who have already transitioned to Medicare can request that any Part B late enrollment penalties be reduced or eliminated. According to a statement, CMS is working toward a permanent fix that will ensure that those affected can access this relief at any time in the future. View the complete questions and answers in .pdf format. Education and outreach staff from the Pennsylvania Department of Banking and Securities will be meeting with senior citizens and the public throughout Southeast Pennsylvania in September to promote financial capability as part of Gov. Tom Wolf’s Consumer Financial Protection Initiative. Information and Educational Fair at Bright Hope Baptist Church, 12th Street and Cecil B. Moore Ave., on Saturday, Sept. 22 from 10 a.m. to 1 p.m.
“Reverse Mortgages – What Borrowers Need to Know,” a presentation to help senior citizens and their families better understand this complicated mortgage product, at Mt. Carmel Baptist Church, 5730 Race Street on Sept. 27 from 12:30-3 p.m. The department’s Investor Education and Consumer Outreach staff works with state and local government agencies, service providers, community and trade organizations, the General Assembly, the military community, schools, and other partners to help Pennsylvanians across the commonwealth become well-informed about the financial marketplace. There are a variety of free, non-commercial programs and presentations available, or a program can be tailored to a specific group’s needs. Download the full schedule of presentations being offered statewide. Today, the Centers for Medicare & Medicaid Services (CMS) announced a new Innovation Center payment and service delivery model as part of a multi-pronged strategy to combat the nation’s opioid crisis. The Integrated Care for Kids (InCK) Model aims to reduce expenditures and improve the quality of care for children under 21 years of age covered by Medicaid and the Children’s Health Insurance Program (CHIP)through prevention, early identification, and treatment of behavioral and physical health needs. The model will empower states and local providers to better address these needs through care integration across all types of healthcare providers. 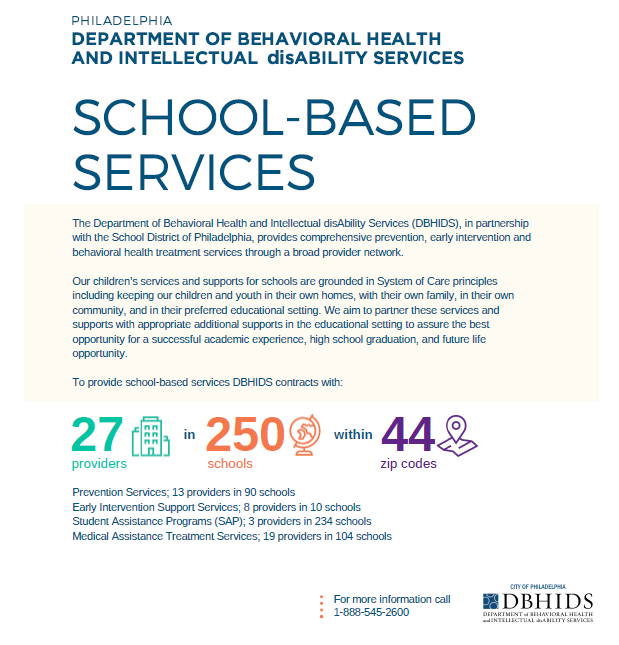 The Department of Behavioral Health and Intellectual disAbility Services (DBHIDS), in partnership with the School District of Philadelphia, provides comprehensive prevention, early intervention and behavioral health treatment services through a broad provider network. Our children’s services and supports for schools are grounded in System of Care principles including keeping our children and youth in their own homes, with their own family, in their own community, and in their preferred educational setting. We aim to partner these services and supports with appropriate additional supports in the educational setting to assure the best opportunity for a successful academic experience, high school graduation, and future life opportunity. The Philadelphia Regional Office of the Centers for Medicare and Medicaid Services (CMS) invites you for a day-long training. This is a great opportunity to advance your knowledge and skills to best assist Medicare beneficiaries, in preparation for the upcoming Medicare Open Enrollment Period, which is October 15 to December 7, 2018. We hope you will take advantage of this day as this is an excellent opportunity to connect with partners, CMS leadership and staff! Topics to include: Medicare C & D updates and other CMS program updates. (subject to change). ‍Mark your calendar for September 26th Come prepared to share and learn –registration details and agenda will follow soon!! The 1st cohort of SafeTogether starts September 6th – they have hired staff, developed curricula and conducted training with the Substance Abuse and Mental Health Services Administration and Bringing Recovery Supports to Scale Technical Assistance Center Strategy, formulated the evaluation strategy and designed measurement instruments with Upenn's Center for Mental Health Policy and Services Research, and set locations, daycare, meals, transportation, and incentives. Download the flyer for this program. Find out more information about the SafeTogether program. The Healthcare Navigation Program is a free program for Medicare beneficiaries to help them coordinate their health care, connect them and their caregivers with resources, and provide support to better understand the health care system. The program, which is administered by the Quality Improvement Organization Program, can help beneficiaries with more complex needs who may have concerns about the quality of their care or what care is needed. Aging network professionals are encouraged to share information about this program with seniors; caregivers; and Medicare education, State Health Insurance Assistance Program (SHIP) (known as Apprise in Pennsylvania) and case management staff. 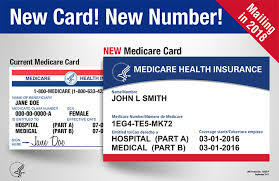 CMS announced the mailing of new Medicare cards to beneficiaries in Delaware, DC, Maryland, Pennsylvania, Virginia and West Virginia. Beneficiaries and other stakeholders will continue to be directed to important mailing information on Medicare.gov and MyMedicare.gov. CMS is also providing new beneficiary and stakeholder resources.